Hispanics aiming to start a company in North Texas should start with these municipalities. 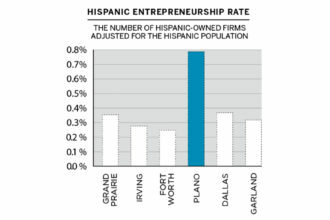 Dallas-Fort Worth is home to four of the 25 best cities for Hispanic entrepreneurs. Surprisingly, Dallas is not one of those cities, according to a recent report by the personal finance website WalletHub. 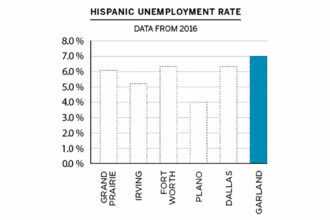 Relatively high unemployment rates for Hispanics, negative gains in revenue for Hispanic-owned businesses, low marks for job security, and poor affordability weighs Dallas down. It shows that Grand Prairie, Irving, Fort Worth, and Plano are some of the best cities in the country for Hispanics to launch businesses. The study analyzed 182 cities, including some of the nation’s most populated, using 23 metrics, including data such as the average growth of Hispanic business revenues, the Hispanic entrepreneurship rate, and the share of Hispanic-owned businesses already in the cities. Grand Prairie was ranked the top North Texas city, coming in as the 5th best city in Texas and No. 13 overall. Irving followed, ranked No. 17 overall; Fort Worth took the No. 18 spot; and Plano came in at No. 25. Dallas, Arlington, and Garland—the only other North Texas cities analyzed—missed the top 25, coming it at No. 31, No. 46, and No. 63, respectively. Topping the list were Laredo, Texas; South Burlington, Vermont; and Charleston, West Virginia. Latinos make up nearly 22 percent of residents living in DFW, according to the U.S. Census Bureau. 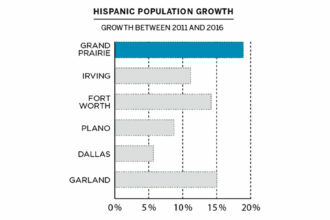 Grand Prairie may have done so well on the rankings because about 36 percent of its residents are Hispanic, the highest rate in North Texas. So, it naturally had the highest share of Hispanic-owned businesses in the area. Surprisingly, though, Plano did nearly three times better when it comes to the entrepreneurship rate. 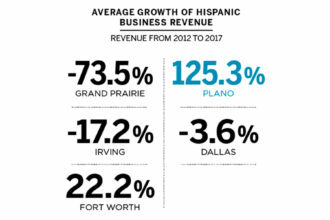 Another surprising factoid from the study, as seen on the next page: Plano Hispanic business revenue grew more than 125 percent between 2007 and 2012, while Irving, Grand Prairie, and Dallas revenues actually shrank. Fort Worth also had positive growth, with revenues rising 22 percent. Dallas has a population that’s about 30 percent Hispanic, and its share of Hispanic-owned businesses puts it at the center of the pack among local cities. 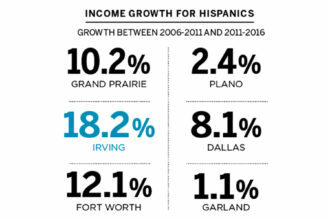 But with relatively high unemployment rates for Hispanics, negative gains in revenue for Hispanic-owned businesses, low marks for job security, and poor affordability weighing Dallas down, Big D still has a lot of room for improvement.